I designed three characters in my character design class this semester. We needed to invent a protagonist, sidekick, and antagonist. I came up with a nervous turtle-girl and her faithful pet, a tiny cow. Opal and Mimi try to solve mysteries in a big city in America in the 1910s (I just love the architecture and fashion of that time). Ms. Bonbidet is their snooty neighbor who says little girls should not be running around solving mysteries. 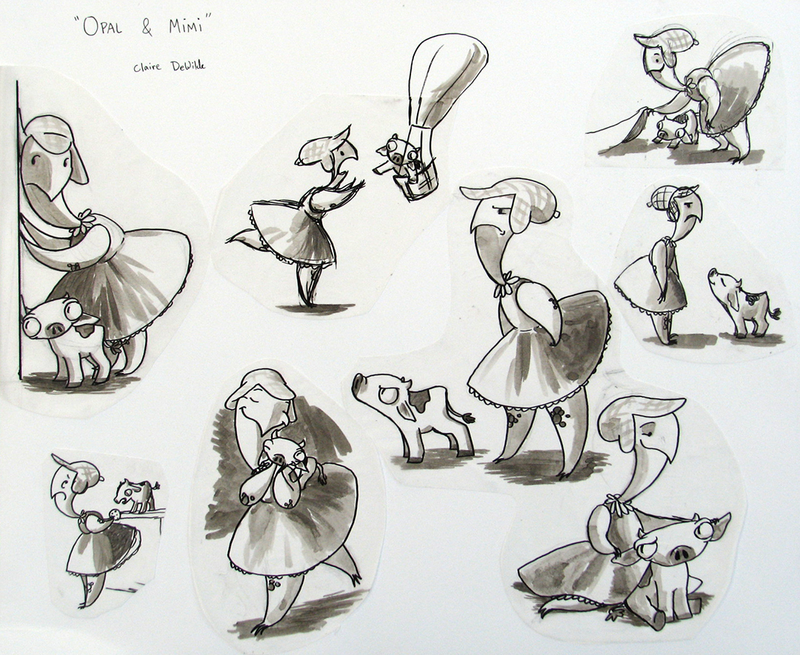 It was fun to explore how a tiny cow and a turtle-girl would relate to each other. I think they make a cute pair! The sketches were all done with Copic markers, and the clean up lineup was done in gouache and pen. I hope to do something with these characters sometime soon! Loved you new character studies. I don’t think I could come up with such imaginative drawings in short notice, or any notice at all. You are very creative. Good work!